Guru Granth Sahib, Sikhism's holy scripture and everlasting Guru, is a collection of 1430 Ang (respectful term for pages), containing 3,384 poetic hymns, or shabads, including swayas, sloks and vars, or ballads, composed by 43 authors in 31 raags of classic Indian music. Fifth Guru Arjun Dev compiled the first draft of scripture known as Adi Granth in 1604 and installed it in Harmandir, known today as the Golden Temple. Adi Granth remained with the gurus until the imposter Dhir Mal, took it hoping that by possessing the granth, he could succeed as guru. Tenth Guru Gobind Singh dictated the entire scripture of Adi Granth from memory to his scribes adding his father's hymns and one of his own compositions. Upon his death he appointed the scripture Siri Guru Granth Sahib eternal Guru of the Sikhs. His remaining compositions are in the collection Dasam Granth. First Guru, Guru Nanak Dev 974 shabads and sloks. 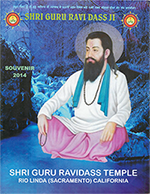 Second Guru, Guru Angad Dev 62 sloks. Third Guru, Guru Amar Das 907 shabads and sloks. Fourth Guru, Guru Raam Das 679 shabads and sloks. Fifth Guru, Guru Arjun Dev 2,218 shabads and sloks. Ninth Guru, Guru Teg Bahadar 59 shabads and 56 sloks. A troupe of minstrels and singers of ballads in the poetic style of Swaya, the Bhatts descended from the lineage of Hindu bard Bhagirath through ninth generation Raiya and sons, Bhikha, Sokha, Tokha, Gokha, Chokha, and Toda. 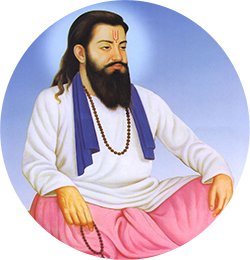 The Bhatt compositions honor the gurus and their families. Eleven Bhatts led by Kalshar including, Bal, Bhal, Bhika, Gyand, Harbans, Jalap, Kirat, Mathura, Nal and Sal, lived in Punjab by the bank of River Sarsvati, and frequented the courts of Third Guru Amar Das and Fourth Guru Raam Das. *Because of similar names and obscure records, some historians believe there were as few as 11, or as many as 19 Bhatts, who contributed to compositions included in Guru Granth Sahib.